FlashSeal is a versatile and easy-to-use flashing repair system that forms a flexible waterproof membrane. It’s formulated for permanent adhesion to asphalt shingles, metal flashings, brick, etc. 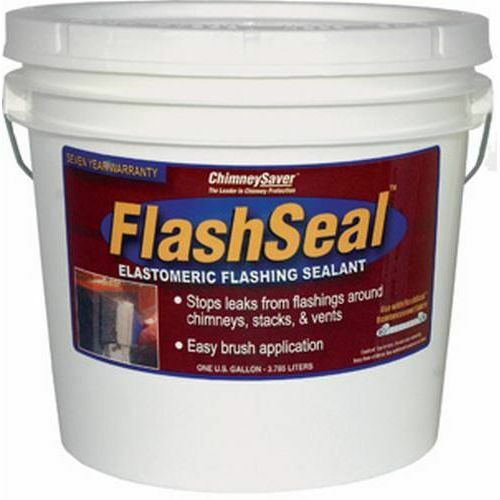 Use FlashSeal to solve problem leaks around the base of chimneys, stacks and vents. Repairing flashings that have been tarred over, split, cracked or are in disrepair is easy with FlashSeal. It’s like installing a custom fit rubber boot at the base of the chimney! It remains permanently flexible and has a 7 year warranty when used with FlashSeal® Reinforcement Tape.